A battery operated, electronically controlled paper towel dispenser must accurately dispense a pre-determined length of paper towel. The dispensing action is controlled by a brush-type DC motor. Battery voltage variation affects motor RPM which degrades the accuracy of the length of the dispensed sheet. Develop novel, inexpensive method to accurately control dispenser sheet length. Measure motor current flowing through a sense resistor. 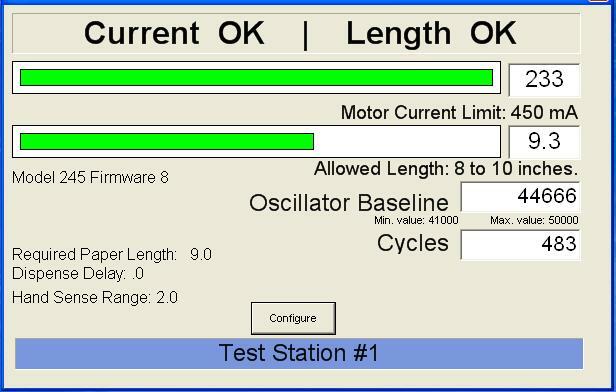 Use microcontroller A/D convertor to periodically sample motor current signal. Extract motor rotation information, from sampled motor current signal, with digital signal processing algorithms. Control motor rotation to accurately dispense a predetermined length of paper towel. Electronic dispenser with inexpensive, sensor-less, accurate paper length control. One US patent. MSP430F2012 microcontroller, A/D convertor, C firmware, schematic capture, circuit board layout, VB.NET test software. Copyright 2012 by Elsyn, Inc.